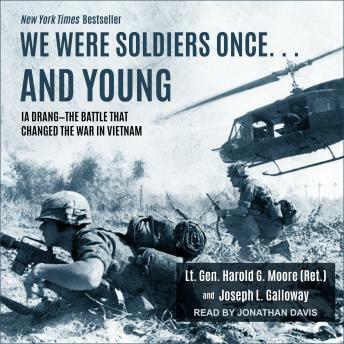 Listen to "We Were Soldiers Once... and Young: Ia Drang - The Battle That Changed the War in Vietnam" on your iOS and Android device. How these men persevered-sacrificed themselves for their comrades and never gave up-makes a vivid portrait of war at its most inspiring and devastating. General Moore and Joseph Galloway, the only journalist on the ground throughout the fighting, have interviewed hundreds of men who fought there, including the North Vietnamese commanders. This devastating account rises above the specific ordeal it chronicles to present a picture of men facing the ultimate challenge, dealing with it in ways they would have found unimaginable only a few hours earlier. It reveals to us, as rarely before, man's most heroic and horrendous endeavor. The book is 13 x times better than the movie ! Don't miss this book ! I have always had questions about this battle. I was just 3 when it took place. My dad was there, he was a Sargent in Colonel More’s Battalion. He lost numbers friends in LZ X-Ray. He still doesn’t talk about it.